When you think of a traditional radiator, what comes to mind? I bet it’s the image of a honking big chunk of cast iron as shown in the photo above. 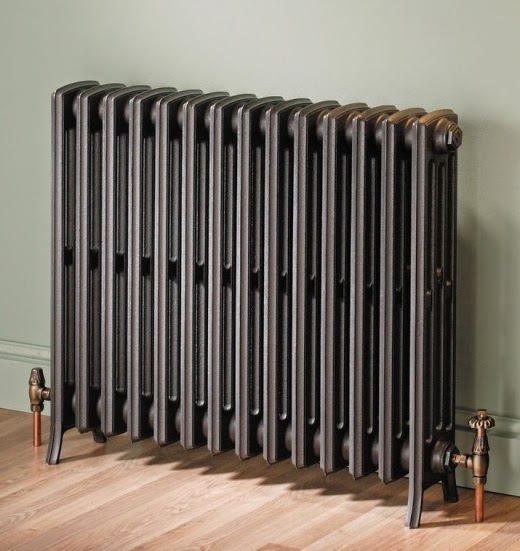 Cast iron radiators are the original hot water heating system in North America. Built to last until eternity, millions of them are still in perfect working condition. You might wonder why they’ve always been made of cast iron and not some cheap and lightweight material like plastic? It’s all about the conductivity and retention of heat energy. In a hydronic home heating system there are three main components; the boiler, the thermostat and the emitter (the baseboard heater or the cast iron radiator for example). In an earlier post I outlined how energy flows through a hydronic system. For this post we’ll look at why steel is the only appropriate material to use as a cover for emitters in a hot water finned tube element home heating system. It’s actually pretty obvious, but since the market is now offering up numerous products that substitute wood and plastic for steel, it’s worth examining why steel is the best way to go. Thermal conductivity units are expressed as the amount of energy in Watts per meter Kelvin. The values above make a clear case for using steel or any other material with significant thermal conductivity attributes. It also demonstrates why the big old cast iron radiators have always been made of big old iron. That iron holds heat. I should note to avoid confusion that it’s common to see finely crafted wood radiator enclosures that dress up the old style rads (the type shown above). These wood enclosures are installed purely for aesthetics. With baseboard heating, the wafer-thin aluminum fins cool down very quickly so a steel baseboard heater cover will act as the heating element for a period of time after the boiler turns off, the same way the cast iron structure of the upright radiator holds heat. Of course there are other reasons why insulating materials like wood and plastic should be avoided for baseboard heater covers. In the case of wood, it is a natural product that contains moisture. Any wood that is exposed to constant heat will eventually crack as the water content evaporates. This includes man-made fiberboard that is held together by glue. Plastic baseboard heater covers, assuming they don’t melt, will offer a low retail price point – but be careful. When you use an insulating material like plastic or wood over an emitter, you might experience a change in the efficiency of the heating system when compared to using a heat conducting material. That low-cost purchase might actually cost you a few extra dollars in the long run. Baseboarders have been designed around the traditional role of using significant amounts of heat-hungry steel around finned tube element. We use heavy duty steel between 18 and 24 gauge thickness. This generous amount of material offers the right combination of durability, structural integrity, heat retention and aesthetic beauty.